If you are one of my Facebook friends or if you've liked our Facebook page, then you know we have a huge love for animals. 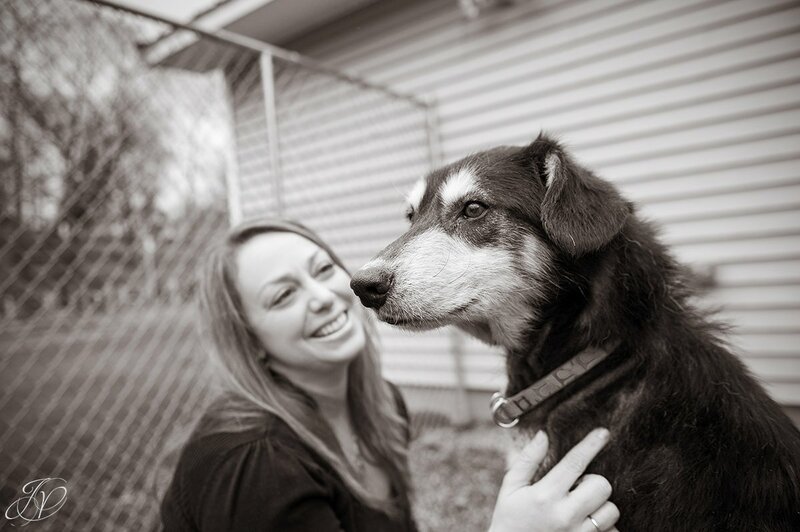 We work with shelters and rescues, photographing dogs who need homes. We've also taken photos for the HSUS Lobby Day for the last two years. 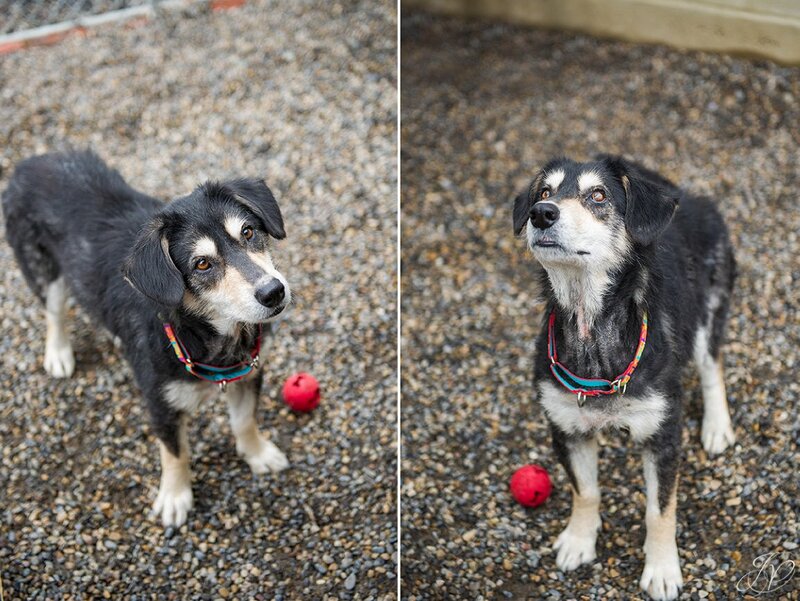 We've even rescued a few dogs and helped them find their forever homes. And we have three dogs and a cat of our own that keep us very busy! When Ed and I brought our Basset Hound Jack in to our lives, we knew it was a miracle. He was our first pet together and life wouldn't be the same with out him. After our first year with Jack we found out that he has an illness that will never be cured: Encephalitis, a lesion on his brain that causes seizures that rarely stop on their own. He takes lots of medicine and is monitored all the time; if he has a seizure that we can't stop, we will lose him! We've had a few scares, but he is a fighter! To say it is a miracle that he has been with us as long as he has is an understatement. We are grateful for every day we have with him. He has been the perfect addition to our family! Our other two dogs, Jill and Zipper were both adopted - one from an animal shelter and another we fostered (and I am proud to say failed!). We know we are truly blessed and these wonderful, beautiful creatures have enriched our lives in so many ways. Because our house is full and our lives hectic, we made the decision that we couldn't foster any more. We knew we still wanted to help animals find their forever homes, so our way of giving back is to help shelters and rescues by photographing the dogs (or cats) who need homes and help spread the word. This year is our fourth year photographing animals in need, and while we don't do it as often as we would like; we do it as often as we can! This year I decided that our work with the shelters and rescues needed to go a step further and that is what lead to this very exciting personal project. As a former journalist, I still love to write from time to time, and I thought why not put those talents to use a little and showcase some of the amazing rescues we work with through stories and photos! 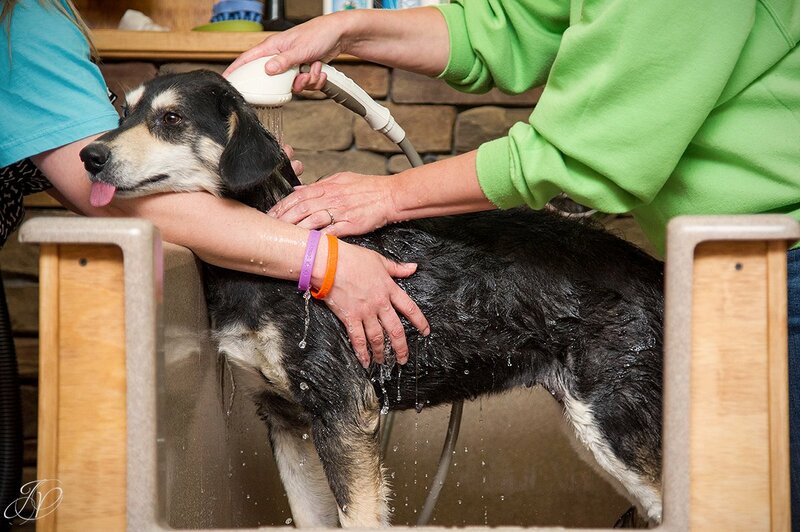 This project is going to be a behind the scenes look at what goes into helping dogs find their forever homes. 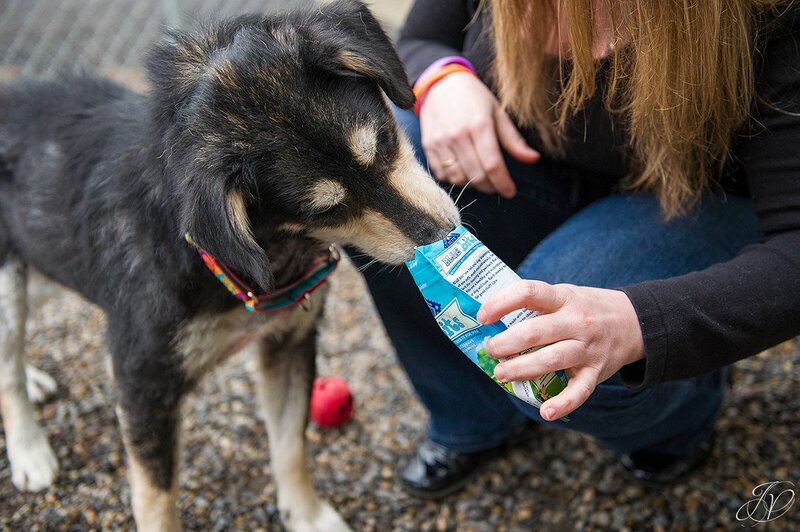 This is the story of what you don't see; when a dog is first taken in, the work done to make a dog adoptable and the hope of a forever family waiting on the sidelines. 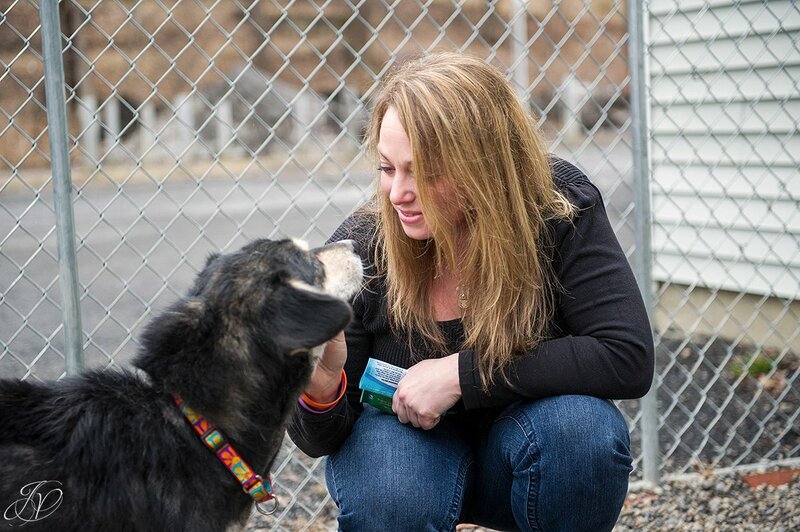 Animals are brought to shelters and rescues for so many reasons. Many times, the dogs have been abandoned by their owners, many have been mistreated, starved, used for fighting. The list goes on and on and the stories just seem to get sadder and sadder. 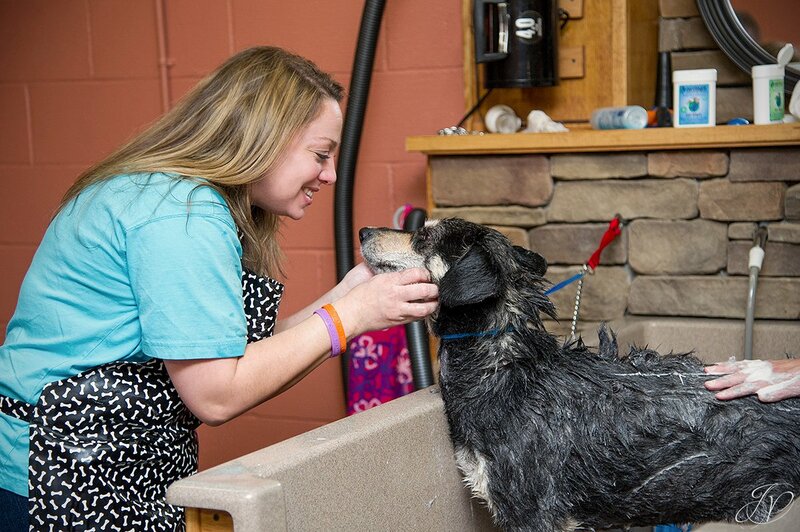 The people at these rescues give their all every day to help animals. 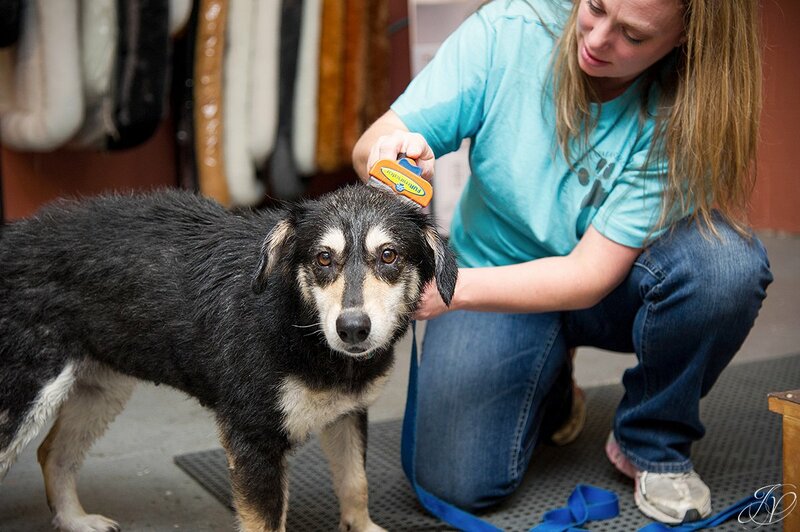 There are often times tears of sorrow when a sad, scared dog is brought into their care. There are tears of frustration when justice isn't done. 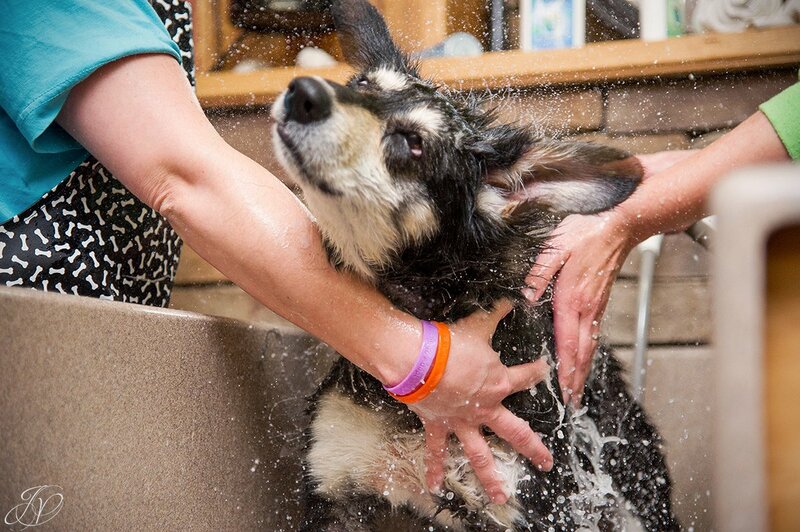 But then there are also tears of laughter from wet, sloppy kisses or from watching the dog run free, playing. And there are also tears of happiness when they say farewell as the dog goes to their forever home, feeling accepted and loved. 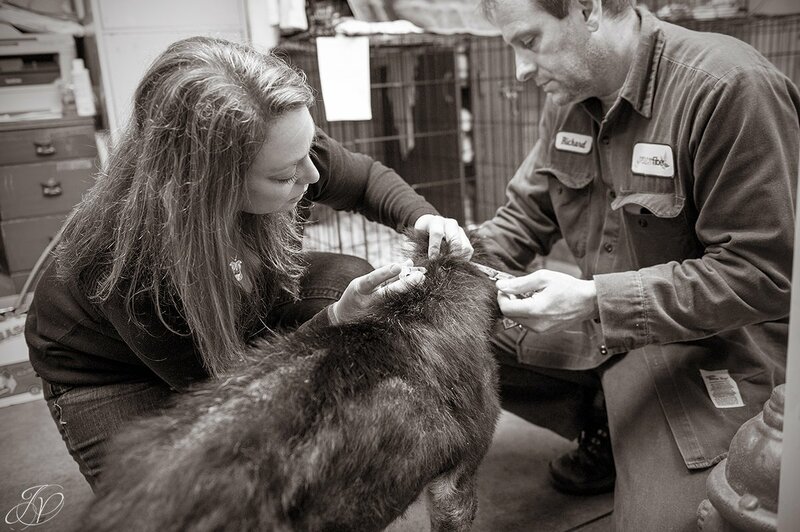 I couldn't be more grateful for the people who give their time for the animals in need. 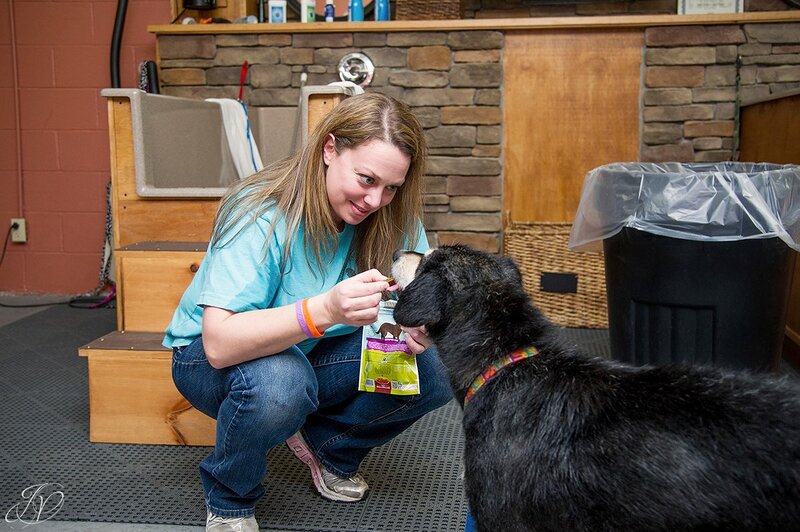 It is like their heart and soul is invested in every animal they rescue. They don't get paid for it and rarely get recognized for it, but they do it anyway. Even on the days when it would be easier to give up, they don't. Their hearts are big and their love is strong. I wish there were more people like them in the world. So here is my way of thanking them for all they do - by telling their stories! This project is going to have many parts and many stories featuring more than one rescue group; please follow along and read the stories! Some of the photos you'll see may be sad, some will break your heart, so be prepared. And while not every animal has the happy ending they deserve, these rescues do their best to make sure as many as possible get it. One of my favorite quotes: "Be the person your dog thinks you are!" by J.W. Stephens. I try to every day. These people don't try, they just do it. I can't wait to tell you their stories! So here is my first series feature: The Suzie Project, Part 1. 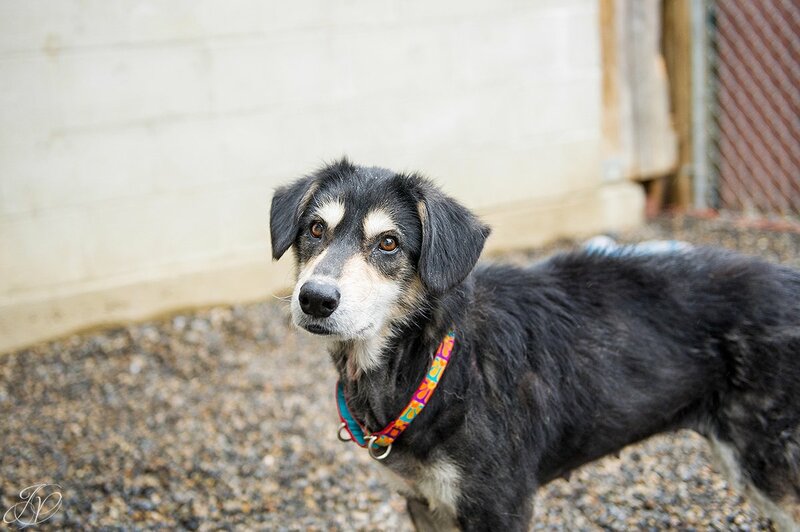 Suzie was brought to Regional Animal Shelter as a stray. It was said she had been passed from owner to owner, but no one ever came forward claiming ownership. She came in weighing only 39 pounds (she should have been at least 55! ), with worms and a skin disease* called Malassezia. 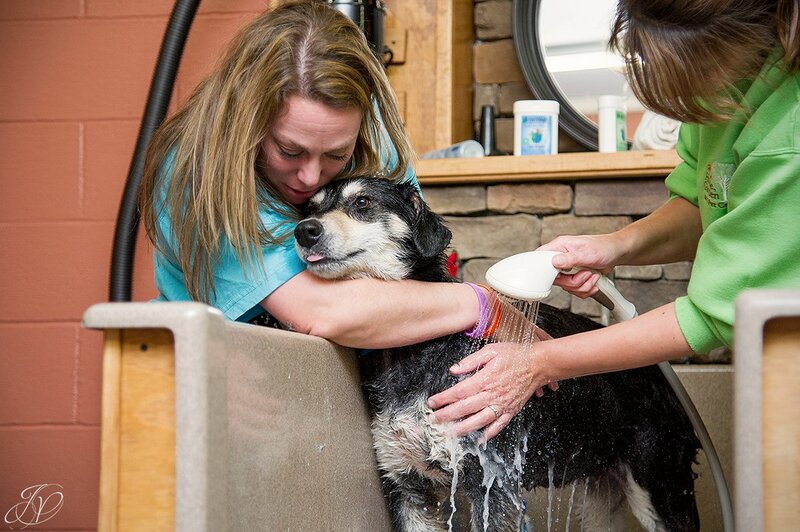 Treatment for the skin disorder requires baths every other day with medicated shampoo, oral medication, shots, vitamins and a grain free diet. Her muscles were also so weak that she couldn't even run and play! 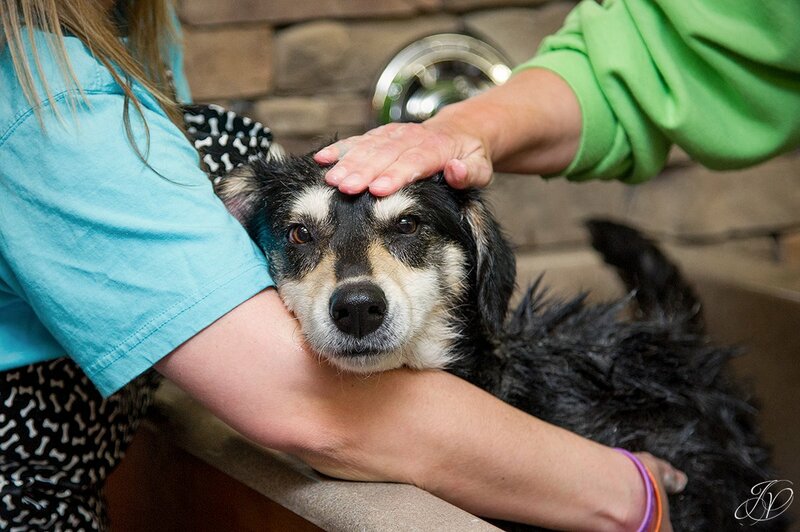 While she came in looking very sad, she still showed unconditional love, affection and trust. Even after being put in harms way, her desire to love is still there in her eyes. *It is easy to cringe or recoil when the word "disease" is used, but this is a very misunderstood term. The term disease literally means "an abnormal condition that affects the body of an organism" (thanks Wikipedia). 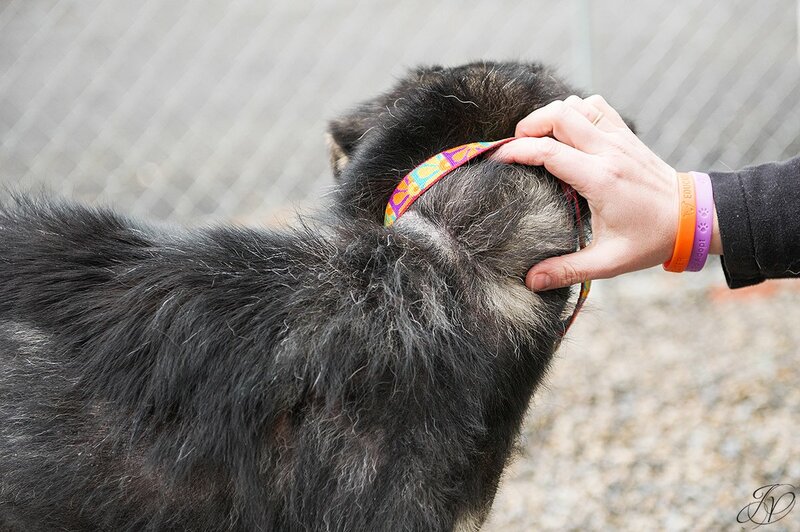 In this case, Suzie was not well taken care of and her skin and fur began to succumb to the disease's side effects (lost fur and brutally dry, painfully sensitive skin). In a later blog you will see this sad dogs features change tremendously after only a few weeks of proper care and feeding. Meet Suzie... Such a beautiful dog! 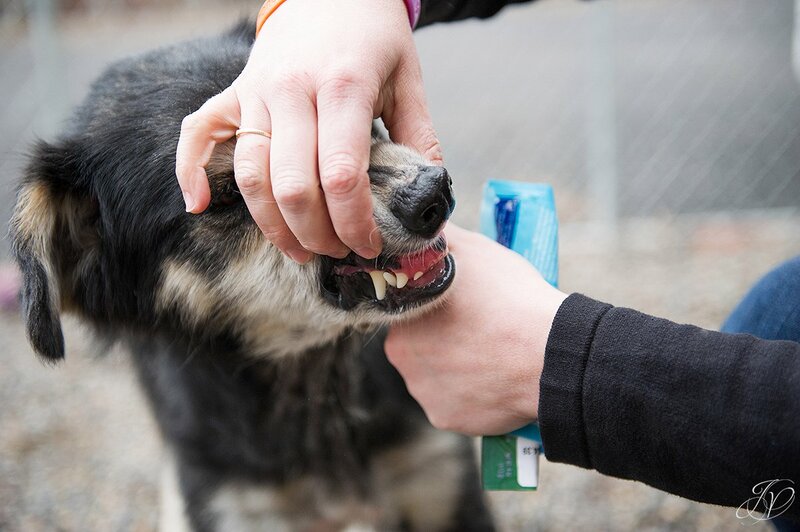 These next few photographs speak for themselves, but you'll see where she is missing fur, her front teeth, her thin body and very dry skin. 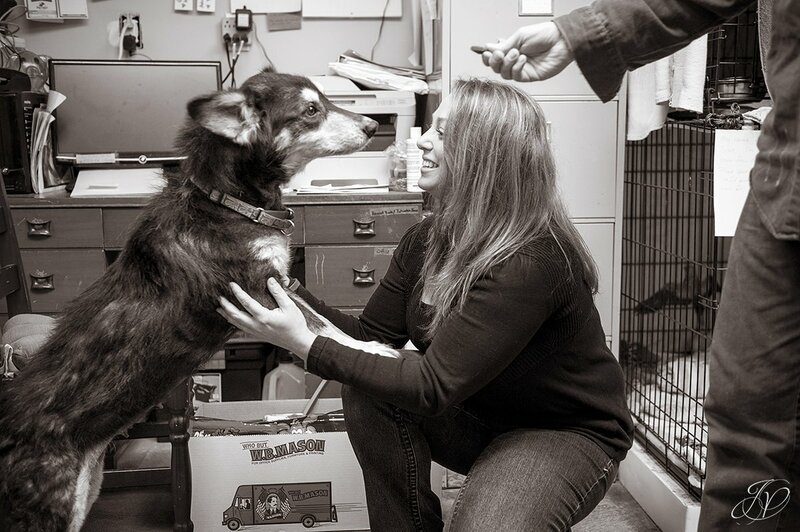 Here Suzie sits with her friend Renee, a very hardworking, dedicated member of the Regional Animal Shelter team. You'll hear a lot more about Renee in another blog, but let's just say for now she is one amazing person! Suzie agrees! She has become Renee's shadow; it is very sweet! 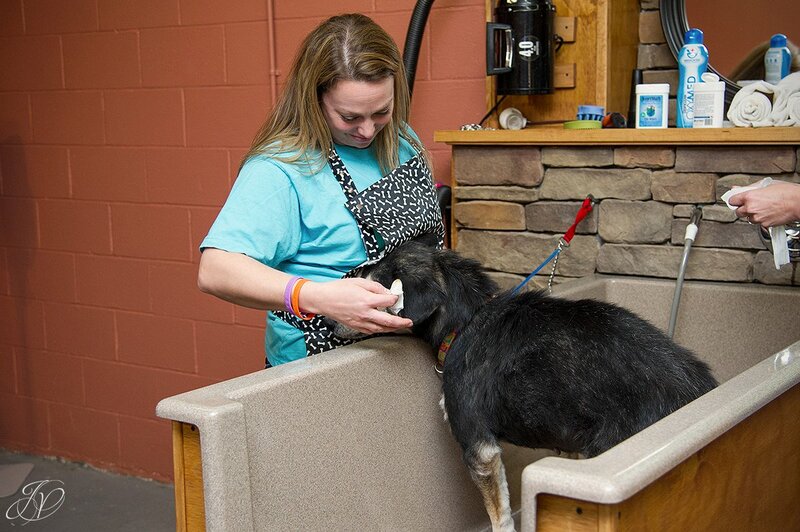 I love watching Renee work with her animals at the shelter. She is truly an insipration. Some words I wanted to share that Renee said recently about Suzie: "These are the dogs that fill my heart. 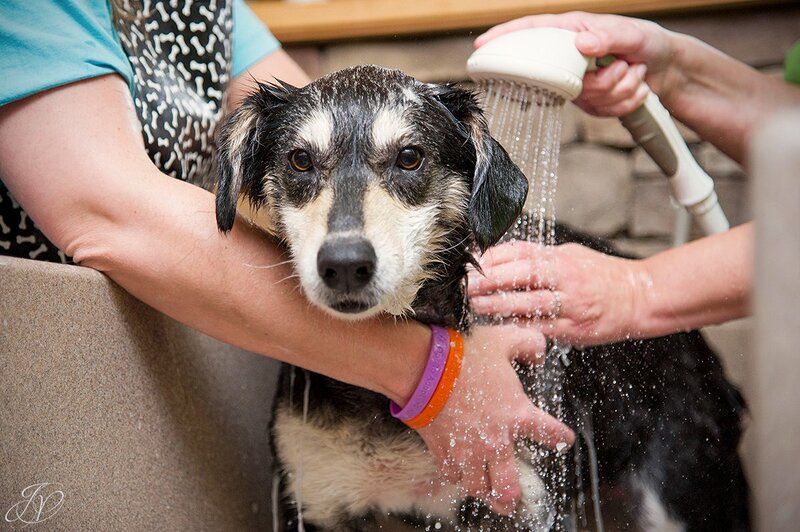 The ones that get overlooked ... "
Every other day Suzie is off to get her ears cleaned and take a bath with medicated shampoos at Harvey's Home, Garden and Pet Center. 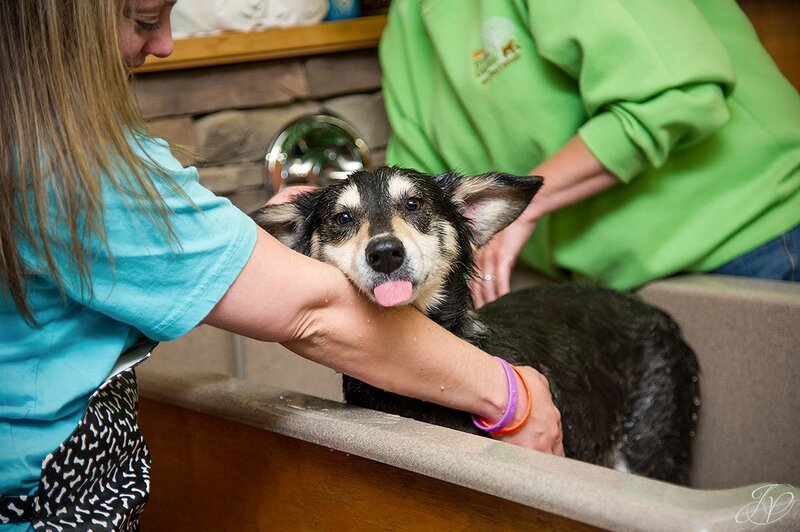 These guys not only donated all of the food and medical supplies needed for Suzie, but they also donated her bathing services while she undergoes her treatments. 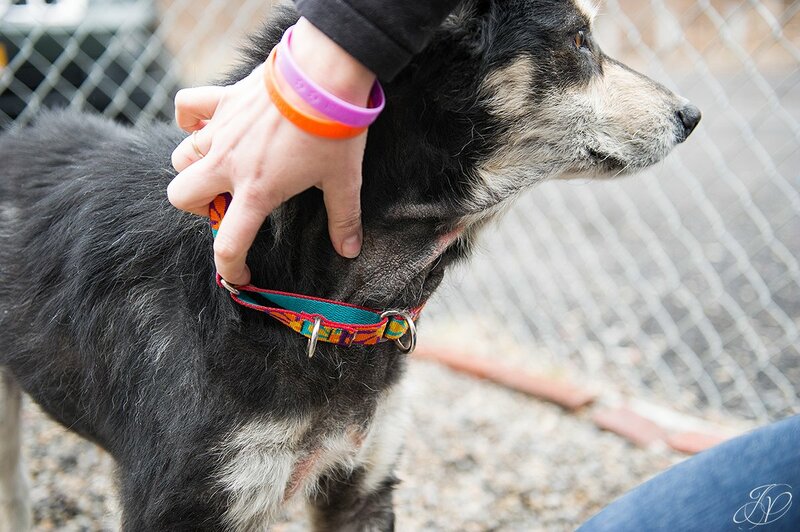 AND gave her the beautiful collar she has been wearing in all her photos. How amazing is that!? 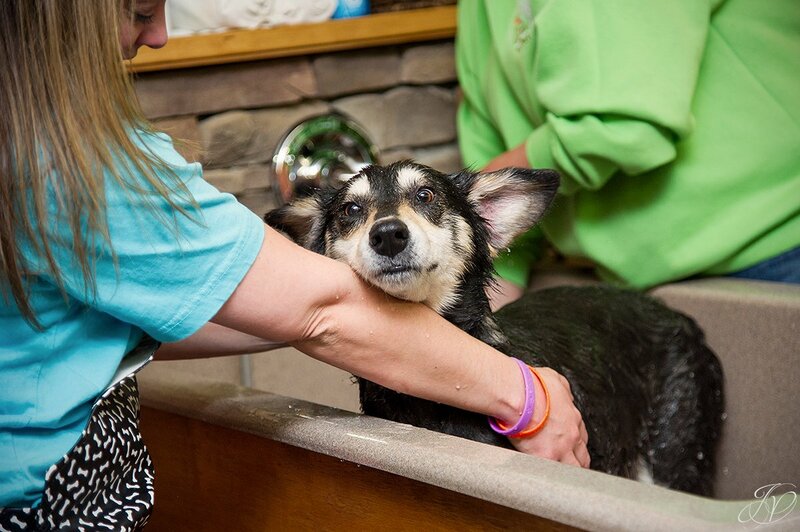 I'll let the photos speak for themselves; I love all of Suzie's expressions! Love this one too! Renee is so comforting for Suzie! I'm going to end Part 1 of this series with this photo, which I love... One more well deserved treat. 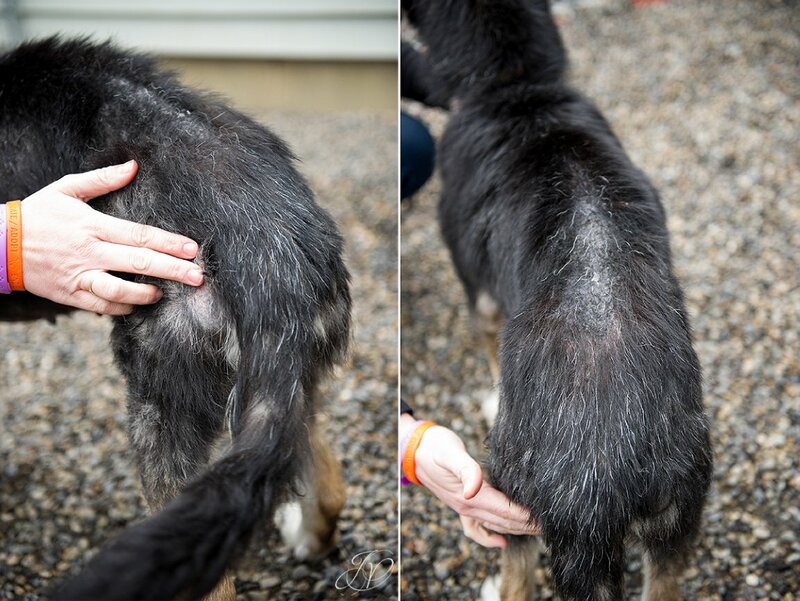 Our next blog on Suzie will feature her progress and maybe even her happy ending; stay tuned! Adrienne Allen - I love these photos, and I love Suzie. I am so happy that she has all of these beyond wonderful people taking such good care of her. God Bless them all. Judy Marcoux - What a wonderful story....thank you ! Cannot wait for her happy ending !! this is awesome! The photos are beautiful and so is the story. You are right, and I know first hand, the people who help these pets are so selfless, they inspire me every day. Keep up the great work! I will be waiting for a happy ending (beginning) on Suzie! Renee Earl - Beautiful job Jessica and Ed! It is an honor to be a part of your project. I am done crying now! Joy - Wonderful photos of a very adorable dog! It's always heartwarming to see how dogs are so forgiving of abuse and neglect and just keep on loving through it all.